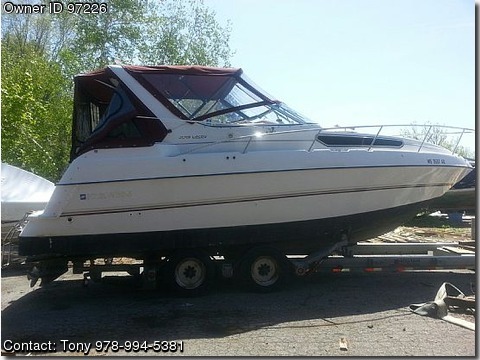 BOAT OWNER'S NOTES for 1994 FOUR WINNS 275 Vista in Very Good condition, call Tony (Boat Owner) @ 978-994-5381. Boat is located in South Hampton, New Hampshire. Overview: This sleek vessel cuts through the ocean at 25 K- 39 K with ease for a thrilling ride, yet at the same time rocks you to sleep dockside serving as a "second home" equipped with A/C and HEAT!, Whether sunning yourselves on the removable bow cushions, or stern side with the completely cushioned sundeck, you will see why we love this boat! At sundown the camper top allows for time to enjoy not only the AM/FM stereo, but the night air too! Features: Fiberglass exterior is 27' 8 " with a beam of 9' 4 " Draft of 3' 3", Full galley and spacious table for six converts to a bed, Head equipped with shower, Plenty of water available from the large 38 gallon tank when not at the dock, Two large holding tanks, one for ocean, the other for gray water if on lake, The swim platform also serves as an outdoor shower with cold and hot water, New custom made drapes and interior cushions, The interior cabin is equipped with three hatches with screens and a window in the aftercabin, Three bilges, large gas tank holding 110 gallons. Engine information: Two 5.0 litre Ford Engines 215 HP - both rebuilt, OMC outdrives, Bennett trim tabs V351, Water heater, Kohler generator, Windless, Two batteries and charger. Instrumentation and Safety: GPS, Depth Finder, VHF, Carbon Monoxide Detector, Life Jackets and Life Ring, Two Shore Power Cords, Stern Anchor and Spot Light. Final Note: This boat is in excellent shape and has been recently surveyed, Can accommodate up to six overnight guests, and is a very comfortable boat, Stainless steel grill and many extras included. If you want to make happy memories, as we have with our two kids, call Tony at 978-994-5381.